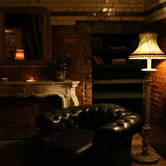 Tooting Tram and Social is fast becoming a favourite night spot not just for me and my group of friends but also a large number of other young professionals living in the South-London area. Open all week between usual pub hours and then until 2am on Fridays and Saturdays, this popular bar is an ideal destination whether you're out celebrating a special occasion or just nipping for a few chilled drinks with pals. The building, before it was refurbished and decked out with particularly cool décor, was used to house trams (hence the name) after a tiring day on the tracks. As such, you are greeted by a huge open space with a huge ceiling that perhaps makes the place feel a bit bigger than it actually is. The main bar is on the ground floor and, although busy on the weekends, tends to have enough friendly, welcoming staff on hand to pour you a fairly reasonably priced bevvie without having to wait too long. 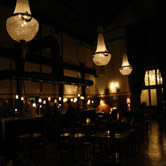 The bar is tucked just off the high street, about 2 minutes walk if you do a right out of Tooting Broadway station. A real positive about the Tram and Social is the fact that there is no entry fee – something that is especially rare wherever you venture out in London these days. They could easily get away with charging a couple of quid for the pleasure and, to be honest, it is one of the few places where I wouldn't feel cheated forking out for it either. The crowd is a good mix and there is always a warm atmosphere. We've been there a decent few times now and are yet to see any kind of trouble – even the bouncers greet you with a smile and a 'Have a good evening'. 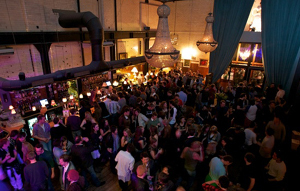 On the weekend, there is often live music if you get there early enough before the DJ comes on to play an eclectic mix of tunes that fills the dance floor with increasingly sozzled punters. If you'd rather wait to throw your shapes, or indeed if you've peaked too soon, take your spot in one of the spacious booths on the ground floor or take yourself away from the hubbub and head upstairs for more seated areas overlooking the dance floor. There is even a small bar up there to save you the hassle of negotiating the busier downstairs area. One of the few negatives, however, is that you won't be able to get a draught beer up here but they do have a good selection of bottles and if you're after spirits then this isn't an issue anyway. The toilets downstairs are clean enough to not be of concern and it is rare that you'd have to queue, even for the ladies. If you're a smoker then you will also appreciate the outdoor area at the front with plenty of benches and standing room to light up without any fuss or queuing to get out. We have been going to the Tram and Social for about a year now and there is no doubt that its popularity is increasing by the week – I'm sure that I'm not the only one waxing lyrical. The website can be found at here and you can call them to reserve an area (as long as you get there before 9pm – we found out the hard way) on 0208 767 0278. Congratulations on your first WN review, Dominic. Great job. Thanks for sharing your thoughts on what sounds like a cool place to hang out.